Ophthalmologists around the world are very interested in a brand new surgery for people with age-related macular degeneration (AMD) . In this procedure, surgeons put two microscopic lenses inside a patient's eyes to help the AMD sufferer achieve an overall better quality of vision. While the NHS doesn't insure this new procedure, patients with AMD can get the surgery done out of pocket. Officially called Scharioth Macula Lens Initial, these implantable lenses are placed in a person's macula via a 2.5mm incision. Recent studies of these lenses suggest they can magnify images by at least 300 percent. Just as a point of reference, regular reading glasses only enhance vision by 30 percent. While these implantable lenses won't cure the debilitating eye disease, they certainly can improve a person's overall quality of life. Many people who get the procedure done in the U.K. say they're able to read, recognize faces, and drive with greater clarity just a few days later. For those who don't know, AMD is a very common disease that often affects the eyes after the age of 60. In normal eyes, waste products are carried into a person's blood stream. As we age, however, it becomes more common for waste products to build up in the macula, which is located in the eye's light-sensing retina. There are two main types of AMD: wet and dry. 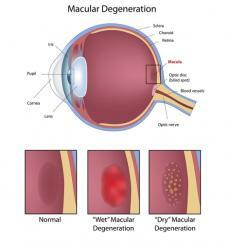 The dry form of AMD, which is caused by the buildup of waste products in the macula, is far more common. This buildup in the macula destroys essential retinal cells in dry AMD patients. Wet AMD, on the other hand, is caused by an abnormal growth of blood vessels right behind the retina. These blood vessels grow because they are trying to get all of the excess waste out of the eyes. Unfortunately, these vessels become so huge that they begin leaking blood. While wet AMD is more rare, it is far more serious. While AMD can't be treated, there are methods doctors employ to halt the disease's progression. Eye doctors often advise patients to avoid junk food and increase the amount of green veggies they get in their diet. A few other treatment strategies include laser surgery, corrective lenses, and blood vessel growth inhibitors. The major side effect from this procedure is that it could cause an eye infection. However, since the incision is so small, this is highly unlikely. Most people who get an eye infection from this procedure can fix it with antibiotics. Besides infections, the only other potential downside to this procedure is that it won't work for the patient. One nice thing about this surgery, however, is that a doctor can easily take the lenses out if a patient doesn't like them. As of today, this AMD surgery costs £6,700 per eye. There's no word yet on whether the NHS will cover this procedure in the future. As of today, about 90 percent of AMD patients in the U.K. have the dry form of the disease. This translates to around 300,000 AMD patients. The number of people with AMD is only expected to rise as the global population ages.